GasLogGuys combines the look of an authentic wood burning fire and the convenience of gas logs with this realistic, hand-painted log set. The multi-step process used to create these logs ensures that every fine detail is captured. This 24-inch log set features rich bark with gray accents, giving great depth to your logs and perfectly complements the bright, fresh cut look given to the underside of the wood. The pine cone decorations complete the scene and will make your guests think that these logs were just brought in from outside. This log set does not include a burner system. It must be purchased separately. Minimum Rear Width Required 26"
GasLogGuys warrants their gas logs to be free from defects in materials and workmanship for lifetime, and they warrant their H-burner to be free from defects in materials and workmanship for ten years from the date of purchase. We bought this set to replace our original wood burning fireplace and were excited when it came. It put together easy and looks great. We've used it more in the past 2 months than we had in the past. The only downside was that one of our logs came cracked and we only received 1 bag of lava rock instead of 2. 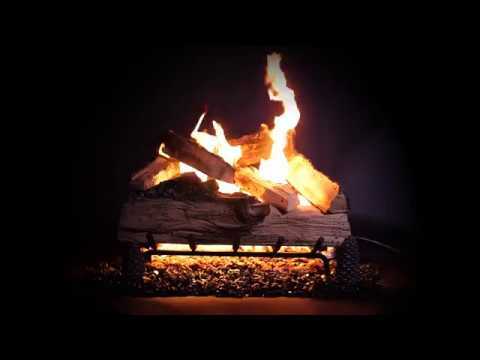 This set will give you the realistic look of fresh split logs with the largest amount of flames and embers we’ve seen on a gas log set in a long time. Not only are these logs painted with detail for extreme realism, they have both a bark side and a split side, allowing you to change the look of your log set as often as you like. Below the logs is a burner like no other. The exclusive H Burner adds rolling flames all the way from the front of your ember bed to the back of the log set, producing more radiant heat than a single burner. We also like the fact that for extra durability, the Grand Mountain set has 1” steel needles throughout the logs and are backed by a lifetime warranty, so you won’t have to worry about replacing logs from cracking or crumbling. While burning this log set, keep your gas valve open to an average level, where flame is right above the logs, to prevent any unnecessary noise. 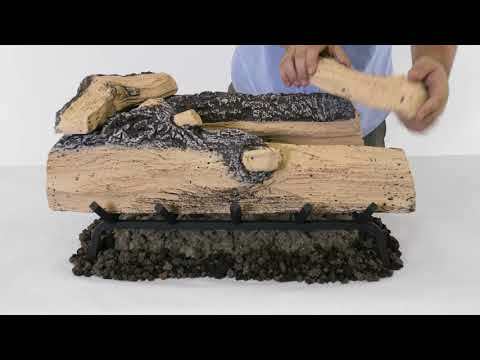 See the Grand Mountain Gas Log Set in action. Hi, Rick! DO NOT use a vent free burner with any other logs than what it came with. Vent Free burners are designed with specific logs so that the flame does not actually touch the logs. WARNING: This product can expose you to chemicals including titanium dioxide, which is known to the State of California to cause cancer and lithium Carbonate, which is known in the state of California to cause birth defects or other reproductive harm.